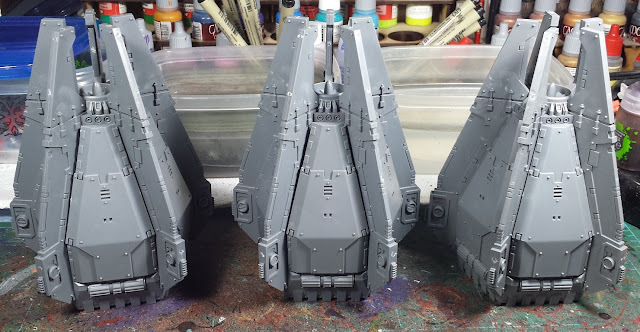 Mordian 7th Regiment: Heresy Era Thousand Sons - Drop Pods built! That said, with some perseverance (and not a little bit of swearing), the three pods have rolled off the assembly line! 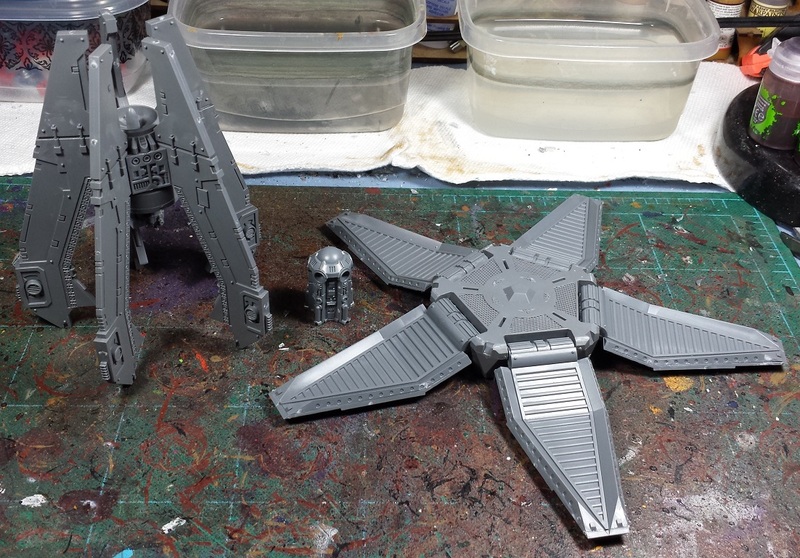 To facilitate painting, the models were built in three sub assemblies. The bottom 'starfish' was built first, then the stabilizer fins and engine were assembled using the starfish as a placement guide but leaving the fins unglued at the bottom. The fit is tight enough that they stay clipped on quite well, but will be glued in place once they're painted up. The center console was left separate as well, I'm not a big fan of the restraint harnesses (a little too busy for the interior) so they're being left out for now. While the top and bottom sections are removable, it's also a truism that they really only fit well in the position they were built. Rotating them to an alternate position works to an extent but in certain cases they don't line up well. To avoid that I marked a single fin and made a matching mark on the starfish (single, double and triple hash marks respectively) so I know which top goes with which bottom and in what orientation. A little pre-planning goes a long way to prevent future problems! Another quick tip that I found helpful when building the bottom section - The ramps sometimes stick or are prevented from closing easily by the design of the center section. 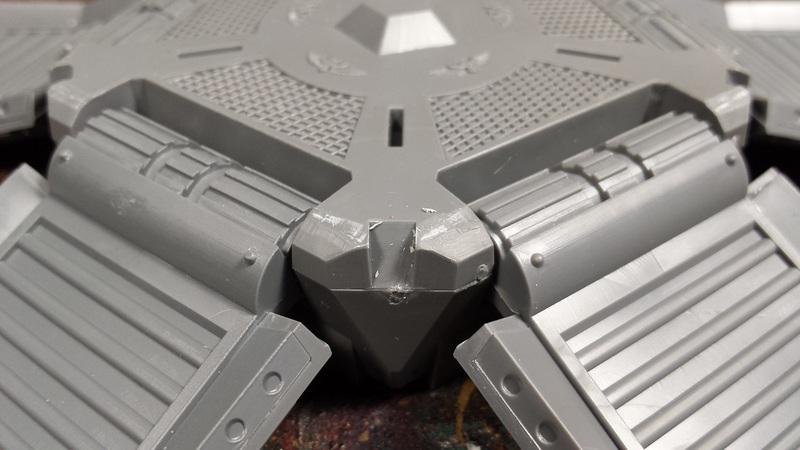 I find that if you shave down the hard corner on the hinge connections, the doors open and close much smoother. All in all not the most exciting bit of construction for the force, but feels good to get them out of the way! At this point there's enough assembled to start doing some test games, and a fair bit more to add to the painting queue! 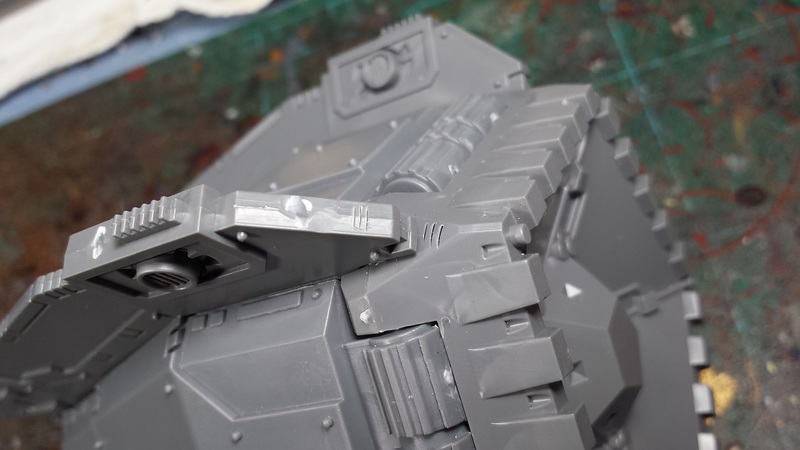 I magnetised my Drop Pod, not sure if this will help? I have three to build and paint for the SOH force. Not looking forward to the assembly stage. @Siph_Horridus: Very cool! I'll have to see if I can do something similar next time around! @DaveTaylor: Oof, I commiserate wholeheartedly. Building these three nearly broke me! Head down and just keep swinging man!! Actually, nice tips on marking the matching find and carving the corners. I had assembled mine as you did and they were a pain to fit back together correctly. Strong play chief. They are going to look rather good. @Riot Ville: Hah! Indeed, there's just no redeeming factor in the construction or painting of drop pods. @Dai: They'll likely get left to the end! @Rory Priest: Thanks very much, man!